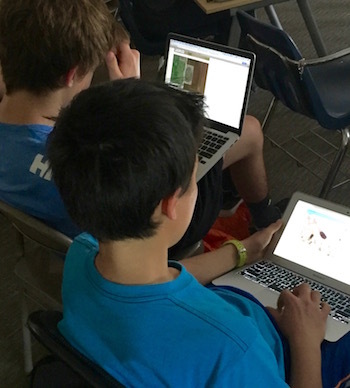 Last month, PLJV staff gave a presentation about the Playa Modifications Assessment citizen science project to middle school students at Mackintosh Academy in Boulder, Colorado. After talking about the importance of playas to both wildlife and people of the western Great Plains, GIS Director Alex Daniels taught the class how to classify playa imagery by looking for hydrologic modifications to playas—like pits and ditches—and identifying the landcover (e.g. farmed, grassland). According to their teacher, Charlie Warren, working on this project allowed the students to apply their lessons to a local, real world issue, and also see how they can have an impact by providing data which will help conserve playa wetlands. This semester the class has been studying about wetlands and the importance of sustaining them. Once they started classifying playas, the students completed more than 3,000 playa classifications of 2,300 unique playas in Colorado in about an hour. By comparing these data with other citizen science data that has been collected as part of the Playa Modifications Assessment, PLJV can verify the accuracy and use this information to better inform playa conservation in the Great Plains.